The power steering fluid level should be checked regularly. 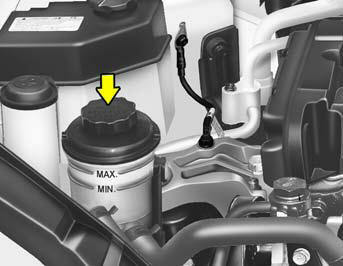 To check the power steering fluid level, be sure the engine is "OFF", then check to make certain that the power steering fluid level is between the "MAX" and "MIN" level markings on the fluid reservoir. o Grinding noise from the power steering pump may be heard immediately after the engine is started in extremely cold conditions (below -4°F). If the noise stops during warm up, there is no abnormal function in the system. It is due to a power steering fluid characteristic in extremely cold conditions. o Do not start the engine when the power steering oil reservoir is empty. It is suggested that you check the power steering hose connections for fluid leakage at those intervals specified in the vehicle maintenance schedule in Section 5. The power steering hoses should be replaced if there is severe surface cracking, pulling, scuffing or worn spots. Deterioration of the hose could cause premature failure. If you desire additional information about maintaining and servicing your Hyundai, you may purchase a factory Shop Manual at your Hyundai dealer's parts department. This is the same manual used by dealership technicians and while it is highly technical it can be useful in obtaining a better understanding of your car and how it works.